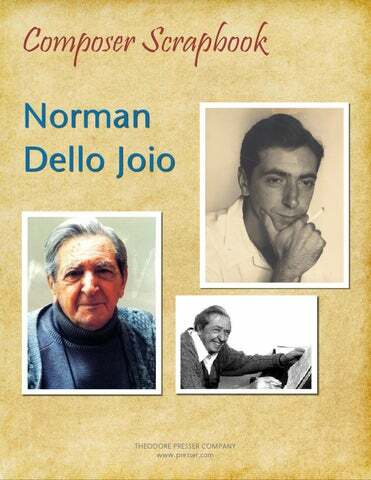 The distinguished musical career of Norman Dello Joio began for him at age fourteen when he became a church organist and choir director of the Star of the Sea Church on City Island, New York. A descendant of Italian church organists, he was born January 24, 1913 in New York. His father was an organist, pianist, singer, and vocal coach. His father taught him the piano at age four, and in his teens he began studying organ with his godfather, Pietro Yon, organist at Saint Patrick’s Cathedral. In 1939, he was accepted as a scholarship student at the Juilliard School, and studies composition with Bernard Wagenaar. In 1941, he began studies with Paul Hindemith, the man who profoundly influenced his compositional style, at Tanglewood and Yale. The partial list of Dello Joio’s compositions include over forty-five choral works, close to thirty works for orchestra and ten for band, approximately twenty-five pieces for solo voice, twenty chamber works, concertos for piano, flute, harp, a Concertante for Clarinet, and a Concertino for Harmonica. His stage works include three operas (one written for television and revised for the stage,) and eight ballets. 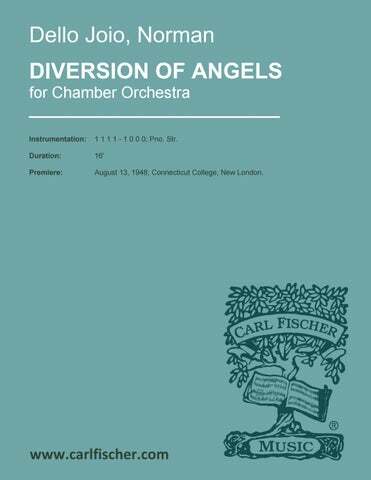 Additionally, he has written nine television scores and three compositions for organ. His published solo piano works include three sonatas, two nocturnes, two preludes, two suites, two “Songs Without Words” a Capriccio, Introduction and Fantasies on a Chorale Tune, Diversions, Short Intervallic Etudes, and Concert Variants. 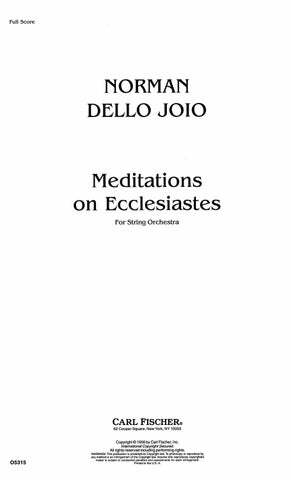 Dello Joio has one published work for piano and orchestra, the Fantasy and Variations for Piano and Orchestra. He has also written a number of pedagogical pieces for both two and four hands. Also included are works for four hands and two pianos. Dello Joio taught at Sarah Lawrence College, the Mannes College of Music, and was Professor of Music and Dean of the Fine and Applied Arts School of Boston University. From 1959 until 1973, he directed the Ford Foundation’s Contemporary Music Project, which placed young composers in high schools who were salaried to compose music for school ensembles and programs. 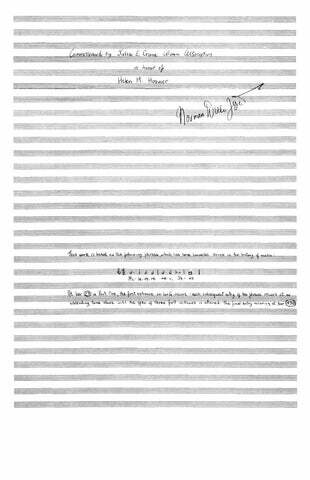 The project placed about ninety composers, many who successfully continued their careers. (Chamber Setting) 22:00 Solo baritone voice; fl., ob. ; vla., vcl. ; pno. (Band) 27:00 SATB chorus; picc., fl. (2), ob. (2), cl. (4), a.sax. (2), t.sax., b.sax. ; hn. (4), cor. (2), tpt. (2), tbn. (3), bar.hn., tba. ; cb., timp., perc., pno. 27:00 SATB chorus; 0 0 0 0 – 4 4 3 1; Timp. Perc. Pno. Str. 15:00 SATB chorus; tpt. (3), hn. (3), tbn. (3), tba. 39:00 2(dbl. Picc.) 2(dbl.E.H.) 2(dbl.B.Cl.) 2 – 4 3 3 1; Timp. 3Perc. Str. 2:30 2(dbl. Picc.) 2 2(dbl.B.Cl.) 2 – 4 3 3 1; Timp. 3Perc. Str. 27:15 3 3 3 2 – 4 3 3 1; Timp. Perc. Hp. Str. 21:00 3(Picc.) 3(E.H.) 3(B.Cl.) 3(Cbsn.) – 4 3 3 1; Timp. 3Perc. Str. 16:00 Ballet version: 1 1 1 1 – 1 0 0 0; Pno. Str. 27:00 2(dbl. Picc.) 2(dbl.E.H.) 2(dbl.B.Cl.) 2 – 2 2 0 0; Perc. Str. 7:00 picc./2/2/b.cl./2 – 4 3 3 1; Timp. 2Perc. Cel. Hp. Str. 16:00 3(Picc.) 2 0 0 – 4 3 0 0; Perc. Pno. Str. 20:00 2(dbl. Picc.) 2(dbl.E.H.) 2 2 – 2 2 0 0; Timp. 2Perc. Str. 27:00 3(Picc.) 3(E.H.) 3(B.Cl.) 2 – 4 3 3 1; Timp. 3Perc. Str. 25:00 1 (picc.) /1/1/1; 1-1-1; Timp. Perc. Pno. Str. 16:00 3(Picc.) 3(E.H.) 3(B.Cl.) 2 – 4 3 3 0; Timp. Perc. Cel. (or Pno.) Hp. Str. 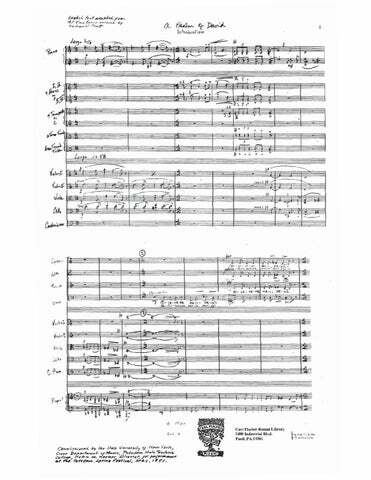 42:00 Solo soprano voice; narrator; SATB chorus; 3(Picc.) 2 2 2 – 4 3 3 1; Timp. 2Perc. Str. 25:00 2(dbl. Picc.) 2(dbl.E.H.) 2 2 – 4 2 3 1; Timp. 2Perc. Str. 8:00 2(dbl. Picc.) 2 2 1 – 4 2 3 1; Timp. Perc. Str. 25:00 3 3 3 2 – 4 3 3 1; Timp. Perc. Str. 21:00 3(Picc.) 3(E.H.) 3(B.Cl.) 3(Cbsn.) – 4 3 3 1; Timp. 2Perc. Str. (formerly – Big City, from Air Power Suite) 10:00 Solo Pno. ; 2(dbl. Picc.) 2(dbl.E.H.) 2(dbl.B.Cl.) 2 – 3 2 3 1; Timp. 2Perc. Str. 17:00 Solo clarinet; 2(dbl. Picc.) 2(dbl.E.H.) 2 2 – 2 2 0 0; Timp. 2Perc. Cel.(opt.) Str. 20:00 Solo Hp. ; 1 1 2(dbl. B.Cl.) 1 – 2 0 0 0; 3Perc. Str. for Piano and Orchestra 22:00 Solo Pno. ; 2 2 2 2 – 2 2 1 0; Timp./Perc. Str. 22:00 Solo baritone voice; 3(Picc.) 3(E.H.) 3(B.Cl.) 2 – 4 3 3 1; Timp. Perc. Pno.(opt.) Hp. Str.